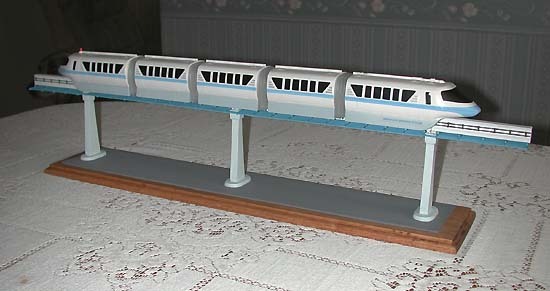 Many of you fellow monorailists probably have one of the Disneyland or Walt Disney World monorail toys. It's a great display to have run them around your Christmas tree. I was always impressed with the accuracy of the train, yet the track supplied with the toy isn't true to the original track. When the Disneyland Resort Mark V toy came out, I decided to make a display stand for it. I used a variety of materials to fabricate the track and pylons. The pylons were shaped from balsa wood pieces of differing thicknesses. The track is also balsa wood, with strips of cardboard along the sides to give it the famous Alweg "I" shape. The local hobby shop supplied me with the many shapes of balsa wood, as well as many plastic pieces used for the track/pylon connector bolts, busbar and carbon catcher. It took a lot of patience to cut all the various pieces and glue them together. To strengthen the pylons, there is a steel bar inside each one that runs from the base up into the track. 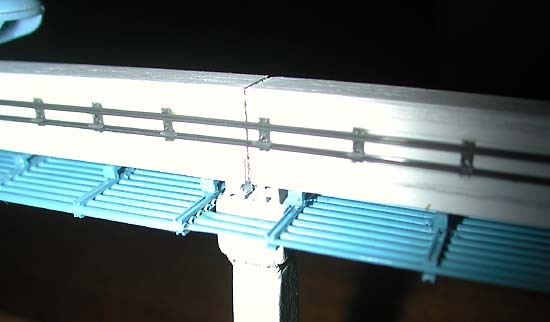 The guideway is painted white with pencil smudges used for tire marks, the pylons are a very light gray-blue. The train has been altered so that it won't run anymore, the guide wheels were flattened on each side to fit the train over this accurately-sized beamway. 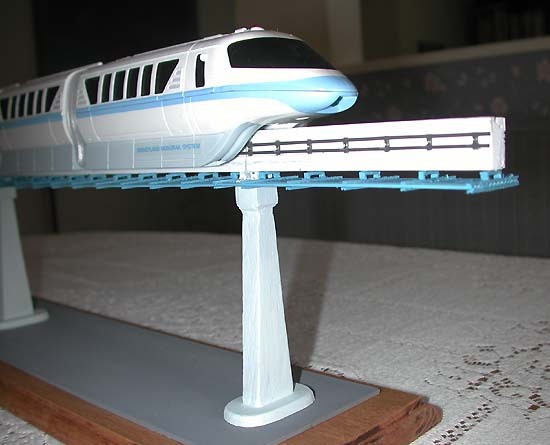 The result is a very nice display of my favorite Disneyland train...Monorail Blue! The track is actually one long balsa wood piece, but I used an X-Acto knife to crease it which makes it appear to be separate beams.